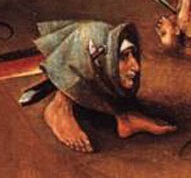 Detail from the bottom of the central panel of Bosch’s Last Judgment in Vienna. In my previous post I mistakenly claimed that bodyhead is the term for what we Dutch-language speakers call koppoter or kopvoeter. In reality, the term bodyhead was coined by English artist Paul Rumsey in the late 20th and early 21st century as titles to his own Two Bodyheads. A quick search in Google Books confirms this. Paul pointed me to the gryllus, a creature similar to gastrocephalic creatures (belly faces), to blemmyae and to his own bodyheads. Gryllus, a term new to me, appears to be an interesting word, leading me to the discovery of the rudimentary taxonomy of hybrid creatures of the title of this post. Gryllus (plural grylli) means pig in Greek and cricket in Latin. (Marina Warner, Monsters of Our Own Making). In Plutarch’s Moralia, Gryllus was one of Circe’s victims who preferred to stay a pig after his transformation. This episode is known as “Ulysses and Gryllus“. Innumerable writers have commented on this episode, see “reasoning beasts”. The history of the grylli has received its most in-depth study in Marina Warner’s Monsters of Our Own Making. Most sources agree that the current meaning of the gryllus derives from Le moyen âge fantastique (1955) by Jurgis Baltrusaitis. There is also this excellent Spanish-language page on grotesque grylli.. This entry was posted in Uncategorized and tagged aesthetics, ancient art, ancient literature, art, bodyhead, grotesque, gryllus, philosophy, taxonomy on February 22, 2014 by jahsonic. 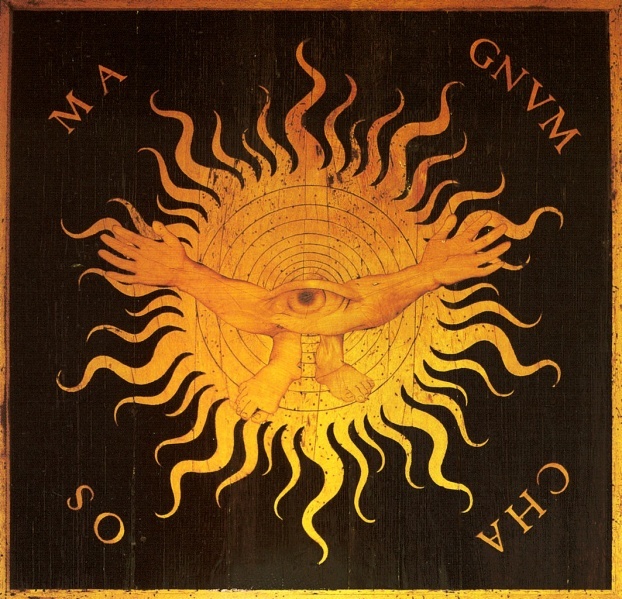 490 years ago Italian artist Lorenzo Lotto produced the image above. The design is a representation of chaos and is entitled Magnum Chaos. It is an intarsia made for a church choir in Bergamo, North Italy. It feels very modern today. It’s a nice example of the eye as independent body part, the eye carried forth by two legs and two feet and in control of both arms and hands. They are called bodyheads in English. See update. Apparently, Rudolf Steiner says something about child art and ‘bodyheads’ in Allgemeine Menschenkunde als Grundlage der Pädagogik, 1919, but I have been unable to find out what. The Magnum Chaos reminds me of the André Masson acéphale illustrations. And other grotesques of course. The image shown above is upside down from the original at Bergamo. Update 20/2/14: A possible English translation of kopvoeter and koppoter is bodyhead, a neologism coined by English artist Paul Rumsey and given as the title to a number of prints. This entry was posted in Uncategorized and tagged chaos, cosmogony, creation, genesis, Italian art, Lorenzo Lotto, mythology, visual art on February 15, 2014 by jahsonic. Last summer I first stumbled upon the Greek philosopher Xenophanes who famously speculated more than 2,500 years ago that if animals had means to create art, they would depict their gods in their own image, in other words, as animals. Yesterday, I researched “Man created God in his own image,” the dictum that reverses the biblical phrase “God created man in his own image”. It goes back to Sigmund Freud and ultimately to Ludwig Feuerbach. Feuerbach, whom I know via French Situationist Guy Debord, who quoted him in The Society of the Spectacle. Freud, who saw the reverse dictum as exemplary in his psychological projection theory. Connected terms are anthropology of religion, Image of God, theomorphism, depiction of God, and anthropotheism. 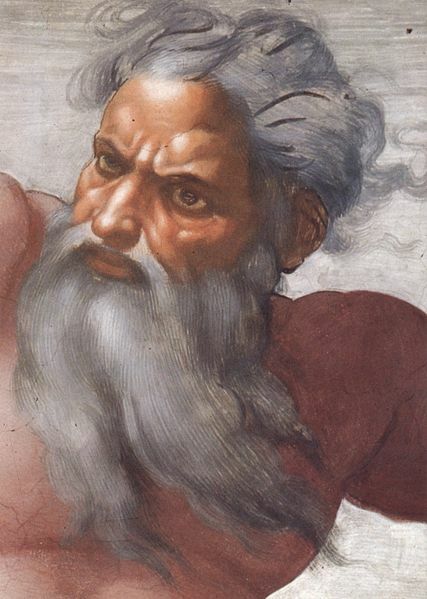 The illustration (above) is Michelangelo’s detail of Sistine Chapel fresco Creation of the Sun and Moon by which depicts God as an old man with a white beard. This entry was posted in Uncategorized and tagged anthropology of religion, anthropotheism, depiction of God, Freud, God, Image of God, theomorphism, Xenophanes on February 11, 2014 by jahsonic. It’s been a while since a piece of writing has given me so much pleasure. The text that caused this merriment is Giordano Bruno‘s satire on divine providence in The Expulsion of the Triumphant Beast(1584). It had me sniggering all the way through. But really, the whole passage is excellent in its power of imagination, in its ability to trivialize providence and omnipotence, in making it ridiculous by giving inane details, which seem like endless digressions à la Tristram Shandy. If you’re curious, you can read the rest of that passage here. I wondered what the exact nature of the ‘triumphant beast’ of the title of the text was, and why, if so triumphant, it needed to be expelled. Some googling learnt that the beast is the the Pope or the Catholic Church. Sadly, the wit in this text was fatal for Giordano. After a trial that lasted eight years, Bruno was burnt at the stake in 1600 for his derision. He was barely 52. PS. I came upon Giordano Bruno by studying De rerum natura, that breviary of atheism, which can be briefly summarized by reading the following three passages: 1)on the helplessness of the human infant, 2) on the inability to reach bodily satisfaction and 3) on the pleasure of standing on shore watching a shipwreck. 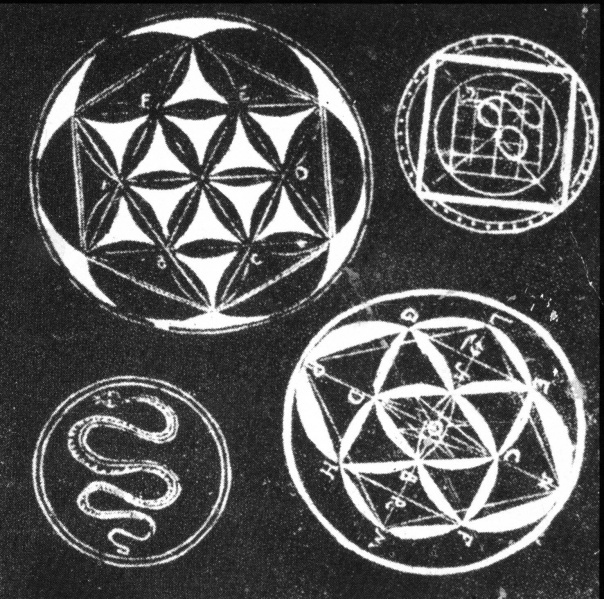 Image: Woodcut from ‘Articuli centum et sexaginta adversus huius tempestatis mathematicos atque philosophos’ by Giordano Bruno. This entry was posted in Uncategorized and tagged atheism, derision, divine providence, Giordano Bruno, irreverence, omnipotence, satire on February 6, 2014 by jahsonic. William S. Burroughs would have celebrated his centennial tonight had he not died one summer day in 1997. I haven’t read all that much by Burroughs (I haven’t read all that much, actually), although over the summer I bought a second hand battered version of Queer in Turkey, which I enjoyed a lot and a couple of years ago in the Pyrenees I read Cities of the Red Night. And of course I’ve seen Cronenberg’s film adaption of Naked Lunch. This entry was posted in Uncategorized and tagged American literature, centennial, William Burroughs on February 4, 2014 by jahsonic.